FAIRFIELD — In 1982, Marcelo Vallejo was a soldier in the Argentine army, and Lou Armour a marine in the British navy. During the Falklands War, or “guerra de las Malvinas,” a conflict that took place from April to June of 1982 in the islands near the southwest coast of the South American continent, Vallejo fired heavy mortar shells at Armour’s contingent. Vallejo and Armour wouldn’t know about that until more than 30 years later. 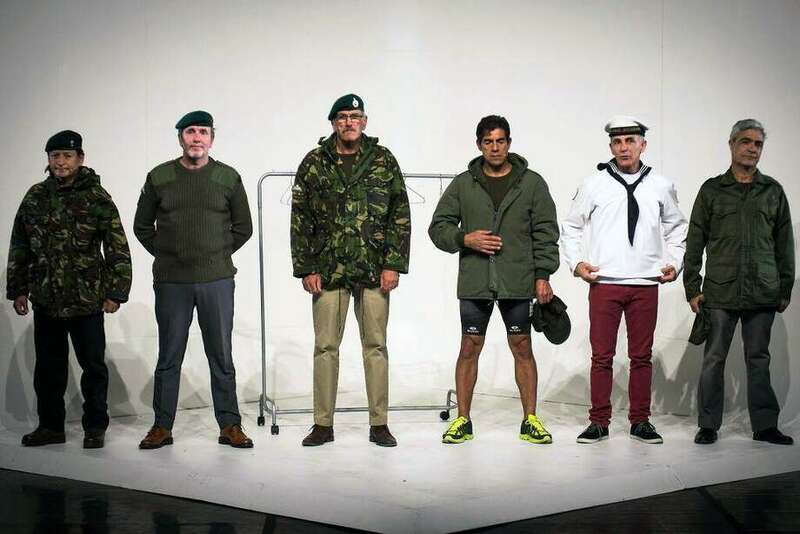 Now, both veterans share the stage and the screen in “Campo Minado” (“Minefield”) and “Theatre of War,” a project that explores the experience of both Argentine and English veterans during the conflict. Ever since they got together under the leadership of Argentine director Lola Arias in February 2016, the group and cast have traveled all over the world with performances across Europe, South America and currently the United States with stops at Princeton, Fairfield and Minneapolis. “I never imagined this, not even in my dreams, it’s something truly incredible,” said 56-year-old Vallejo. It’s a journey that both the South Americans and European veterans alike have said has altered their perspectives while bringing them together. The experience has not only united the former enemies of war together, but other veterans who have seen the performance throughout the more than 30 cities in which they have acted. For Arias, the director of both the film “Theater of War” and “Campo Minado,” the plan to get English and Argentine veterans together was almost unthinkable and something that faced opposition from various institutions, both in Argentina and abroad. Vallejo was one of those people, until some of the other cast members pushed him to go through with it. “At the beginning, I told (Arias) no. I didn’t want to have a relationship with the English, but (Arias) is very insistent and well ... after a while, other members of the play convinced me,” Vallejo said. Ruben Otero, a former Argentine navy man who survived the sinking of the Argentine vessel the Belgrano during the conflict, never imagined he would be traveling around the world, let alone with the very people who once considered him the enemy. Lori Jones, director of programming and audience development at the Quick Center for the Arts at Fairfield University, said the movie and the show provide a unique and intimate perspective. A film screening of “Theatre of War” will play at the Fairfield Theatre Company on Jan. 23 at 7 p.m., followed by a seminar at the Quick Center Jan. 24 at 5 p.m. Lastly, “Campo Minado” will be performed at the Kelley Theatre on Jan. 26 at 8 p.m.
Arias emphasized that the past two-and-a-half years have been a bonding experience for the entire group.